"If only they'd give me actual 1947 Cheval-Blanc, not grape juice." • The stars of the new wine movie Bottle Shock were in New York this Monday for the film's local premiere. At a lunch the next day, some of the cast confessed that they didn't know much about wine before filming, but they certainly had a lot of fun learning, with the opportunity to taste wines from Chateau Montelena, Heidi Barrett's La Sirena label and other prominent Napa and Sonoma producers. 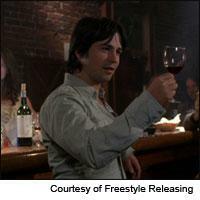 Freddy Rodriguez, who earned critical acclaim as a mortician on the HBO series Six Feet Under, said that the most interesting thing he learned was how wine aficionados can pick out such distinctive aromas and flavors, like bacon fat and melon, as Dennis Farina's character does in the film. "My palate is definitely more discerning now," said Rodriguez, who plays Gustavo Brambilo, a young Latino worker at Montelena and aspiring winery owner who is so good at identifying wines that he wins bar bets by picking out the grape variety, producer and vintage in blind tastings. But can the actor now pick a 1947 Cheval-Blanc out of a lineup, as he does on film? "I'm not there yet!" he admitted, laughing. Alan Rickman as Steven Spurrier, making use of some California-casual glassware. • Rodriguez's Bottle Shock co-star Alan Rickman—whose film credits include Die Hard, the Harry Potter series, The Hitchhiker's Guide to the Galaxy and Sweeney Todd—played the character of Steven Spurrier, the British wine expert who staged the 1976 Paris Tasting to help promote his Paris wine shop. Among his personal wine highlights during filming, Rickman recalled a tasting of Heidi Barrett's experimental dry Muscat and how surprised he was "at being given a taste of something so special," and a tasting of Scarecrow Cabernet. "They brought that out from what seemed to be the safe," he quipped. While Rickman too claims not to know that much about wine, he said it didn't take him too long to learn how to swirl, sniff, sip and spit well enough to play a wine expert. "It's not that difficult really," he said, laughing. What's difficult, he added, is evaluating the wine and coming up with proper descriptors for the aromas, flavors and structure. "All we were doing was smelling and tasting grape juice!" • Archaeologists unearthed wine bottles from the 18th century during a recent excavation at Rutgers Stadium in Piscataway, N.J., which is being expanded to accommodate the Rutgers University football team and its growing fan base. The area of expansion is located above the ruins of a trading and merchant town once known as Raritan Landing, and wine bottles, tumblers and glasses from the 1700s were found at the site, which is believed to encompass the remains of a bar known as Rising Sun Tavern. While Unfiltered is always excited about wine bottles old and new, Rebecca Yamin, principal archaeologist and senior project manager for John Milner Associates, the Philadelphia-based archaeological team on the job, said that they're nothing new on a dig like this. "Glass lasts, which is one of the reasons why you find lots of wine bottles on a job like this," she said. "It's just one of the things you find in 18th and 19th century digs, [along with] liquor bottles and medicine bottles. But there wasn't an inordinate amount. There was no indication of great drunkenness at the time." Chris James and the treasured 1893 Veuve Clicquot. • Meanwhile in Scotland, it didn't take an excavation to dig up the oldest known (and fully intact) bottle of Veuve Clicquot. Chris James, heir to Torosay Castle on the Scottish Isle of Mull, recently went rooting around in an old sideboard in the castle's kitchen. The piece of furniture contains four storage areas, one of which was locked, with no key in sight. When James finally opened the locked area with a key he'd had specially made, he found an old decanter, a cracked bottle of well-oxidized Brandy from 1865, an 1893 bottle of La Tour de Carnet from Médoc and an 1893 bottle of Veuve Clicquot. "My great-grandfather, my grandfather and my father all walked past the locked cupboard but never bothered to get into it," said James. "The label on the bottle of Veuve is in mint condition because it sat in the dark, although the contents are likely insipid." He added that he has since returned the historic bottle to the Champagne house, which in turn gave him a case of 1995 La Grand Dame Brut as a gesture of thanks. • Back in the States, the Champagne bubbles just aren't aligning for East Hampton, N.Y. gallery owner Ruth Kalb. Over Memorial Day weekend, local police handcuffed and hauled her out of an opening at her Vered Gallery for serving Veuve Clicquot and Channing Daughters wines without a permit, and now the local paper prints a story every time someone lifts a glass in the gallery. Like the Little Goody Two-Shoes in the neighborhood who tells your parents about the party you had in their house when they were away, Long Island Newsday issued a surveillance-style blow-by-blow account of an invitation-only party held at the gallery this past weekend: "Bottles and glasses stood on a table. It wasn't clear what was in the bottles - reporters weren't allowed in." We're all for upholding both the letter and the spirit of the law, but we do hope that Kalb obtains a permit, so that everyone can move on to more pressing matters. After all, there were 24,980 arrests made in Suffolk County, home of the Hamptons, in 2007, and we'd venture a guess that most of those offenses were more serious than being generous with the bubbly. • In other legal news, one suspected member of the Languedoc-based wine protest group CRAV (Comité Regional d'Action Viticole) may be at the end of his alleged reign of terror. According to the French newspaper LaDépêche, the young owner of a small vineyard near Narbonne, Jérôme Soulère, was arrested after being injured while working on explosives in his cellar. The government, which has also accused Soulère of planting a small bomb along the route of Tour de France in 2007, believe he was constructing a bomb to use during future CRAV "operations," the paper said. Soulère's lawyer denied the charges, stating that his client was handling explosives because he was working to rid his property of unwanted tree stumps. The CRAV frequently attempts to interrupt what they see as unwanted foreign and/or corporate influence in the French wine trade. Often they attack government property, but are also suspected of dumping nearly $500,000 worth of wine from vats at the large wine co-operative Val d'Orbieu last month. For his part, Soulère is charged with the retention, manufacture and transportation of explosives; according to the paper, his lawyer hopes to have him released within a month.